I don't think 2M for NSMBU is guaranteed at all. I realize that it's a launch game but it's doing sub 7k numbers now with less than 500k sold, so it would need more than 200 weeks selling at 7k to get close to 2M. It will depend on how fast (and if) Nintendo can turn things around. NSMBU's roadblock is the high price for the hardware. I'm pretty sure a lot of 2D Mario sales are impulse purchases, but for that to work the price must be right. With that not being the case right now sales are naturally slowing down, but for Mario games that never meant their sales being cut short. NSMBU will sell plenty, the only question is when. A lot of people are expecting the Wii U to fail at reaching GCN-levels. In the end the Wii U is then expected to barely hit 4 million in Japan by these people. Achieving an attach rate of 50% over the lifetime of a console seems a bit outrageous. reminds me of when people were saying the 3DS would do GCN numbers. Well, that's why I say that it depends on when and if they turn things around. 2M is possible but not guaranteed. There's a point in time when it's too late for a game to start gaining significant momentum, even for a game like NSMB. - Demon Gaze and Monster Monpiece sell-through over 90%. NSMB DS sold 1M in 2007, 1.5 years after the game was released, with yearly hardware sales of 7.1M. NSMB DS sold 377k in 2008, 2.5 years after the game was released, with yearly hardware sales of 4M. NSMB DS sold 287k in 2009, 3.5 years after the game was released, with yearly hardware sales of 4M. NSMB DS sold 355k in 2010, 4.5 years after the game was released, with yearly hardware sales of 2.8M. NSMB DS sold 254k in 2011, 5.5 years after the game was released, with yearly hardware sales of 650k. NSMB DS sold 133k in 2012, 6.5 years after the game was released, with yearly hardware sales of 68k. NSMB WII sold 1.6M in 2010, 1 year after the game was released, with yearly hardware sales of 1.6M. NSMB WII sold 300k in 2011, 2 years after the game was released, with yearly hardware sales of 900k. NSMB WII sold 150k in 2012, 3 years after the game was released, with yearly hardware sales of 470k. I assume WII U will sell at least 900k for the next 5 years, current NSMB U sales = 500k, with yearly sales of 300k, after 5 years it'll be 1.5M. 2D Marios are gonna do around 150k at the minimum yearly, despite how bad the hardware sales. With the Wii U just coming out, high console price, userbase still low and with many holiday boosts to come, although a bit of a struggle I don't doubt it'll eventually get there. The game will probably eventually be bundled, so actually that will probably give it a better chance. Yes, I just expect 1) Wii U to not sell like GameCube or N64 and 2) NSMB U to continue to have significant sales through the lifetime of the console. If someone honestly thinks Wii U is going to sell like GameCube or N64 in Japan in the end, then the issue isn't with their NSMB U estimations. how much exactly do you expect Wii U to sell in the end? GC was held down by PS2. There is no PS2 home console this time, so I still expect it to sell > 10m easily by the end. That is dependent on much more than just Nintendo first-party games coming to the system, but I still expect better results for that down the road, too. Or that PS3 would do GCN numbers. Based on Compile Heart's 1 week estimate for additional Monster Monpiece copies to hit stores, I'm assuming those numbers don't include a re-shipment. Digital bundle this Christmas I'd think most likely. Lemme guess, the lump together vita and PSP? That will only further enhance the confusion between Capcpom and Konami. No Vitas were given that day. I don't expect it to sell Gamecube numbers. I'm just very cautious of predicting it to easily sell over 10 million when the Wii's collapse showed that unless Nintendo continually produces a range of software for Wii U it is not going to be able to maintain healthy sales throughout the year. And no the Wii U doesn't have the PS2 pushing it down. It has the 3DS which will outsell the PS2. Yeah, with Pokemon, Dragon Quest, Animal Crossing, Mario and Monster Hunter all staying strong on handhelds for the foreseeable future, it seems like the home console market might be capped at about 20M max for the next gen. It that's the case, then it just comes down to how the WiiU/PS4 split up that number (and there's no guarantee that the total can't even fall below 20M). Of course, Sony/Nintendo always have the possibility of finding a massive breakout hit or two to drive the home consoles, but even with the Wii Sports breakout hit last gen, the home systems still barely broke the 20M threshold. Sega & All Stars number is for US+Europe? It's possible that with Vita not being a factor we could see large resurgence in home consoles, but there is also a chance that a large part of the market just disappears into spaces not so easily seen or just doesn't buy multiple hardware. Why is the latest Wii Taiko selling so much?! Wii U looks like its descent might be slowing. Slightly. Hokuto Musou 2 actually sold better than I thought it would. Of the six thousand copies, if even only one thousand were new users, it's enough to keep the system above 10k (same thing that happened to the Vita last year). Boring week, fortunately next week we will have a big launch (Dragon Quest VII). What's the new Wii U game? Only thing worth noting is Fantasy Life. I wonder how long it can continue to sell 20,000 copies. It's good to see Fantasy Life holding after vanishing from the charts. I would love to know what the download numbers are for it, seeing as it was impossible to find for like 3 weeks. I bet L5 is kicking themselves for undershipping that beast. All-Stars Battle Royale mega bomba. I would think it will stabalize right around the 11-12K mark. Under 10K would be suprising to me. 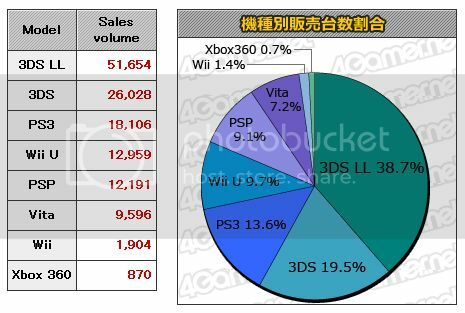 Will Wii U overtake Vita LTD this year? I'm not sure anymore. Oh, no. More "stabilization" talk. Wii U = Vita confirmed. Hint: We're still in the typical holiday affected sales period. Usually completely filters out of the equation by late February or so. Yes, Wii U will smash Vita LTD this year, though. Just not anytime soon.